I've been somewhat falling behind in sharing the wonderful fabric shops that I've been able to visit so what better way to pick up than to talk about Backstitch! I visited this shop on a trip to Cambridge in November and it is every bit as lovely as it seems. The fabric shop is also surrounded by lots of other lovely independent shops so it's a great place to visit even with people who are reluctant to traipse around yet more fabric shops - in my case I often drag my sister along with me much to her annoyance! 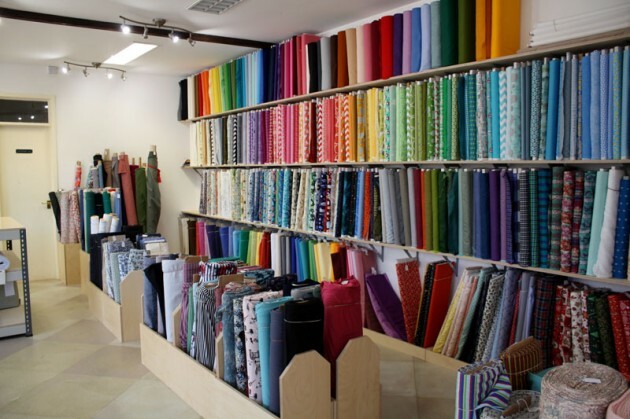 Although many independent fabric shops all stock fabrics by popular designers such as Atelier Brunette etc I love discovering fabrics that I haven't seen elsewhere and every shop has something unique. I'm always on the hunt for jersey fabrics in particular as good quality jersey is hard to find. I only actually bought one fabric while I was in the shop despite being tempted by many others! I actually almost didn't buy this one either but was persuaded to do so by my Mum and I'm so glad I bought it. I bought this absolutely gorgeous grey knit fabric with a pair of jogging trousers in mind. As you can see from the finished trousers the fabric was perfect. It's a lovely colour and is really soft inside. I've visited Backstitch once and it was brilliant, do order online from Alice and she is so fast at delivery. It looks like a lovely place! I really like the second fabric you purchased with the orange-red color. So pretty!